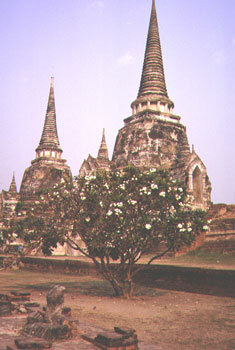 A tree blooms under the Sri Lankan-style chedis at Wat Phra Si Sanphet in Ayutthaya. The ringed spires symbolize the 33 levels of heaven. Ayutthaya, in the Central plains, overtook Sukhothai as the most powerful kingdom during the mid-14th century. Its end came in 1767 when, after centuries of conflict with Burma, its capital was destroyed. These chedis, once golden and housing ashes of kings and caskets of Buddha images, lay in ruins until this century.